Ninja~Monkey Ninja Monkey has arrived! Joined on November 4th 2014, last online on 10 April 2019. Where is your avatar from? TimeSplitters? This monkey one is from time splutters? Yeah, that seems to be the case with many of the VGC users, me included ^^ They'd be lurkers for a while and then they'd make accounts. So, which of the big 3 is your favorite? Ah, I'm actually big into PC gaming, I don't really like playing games with choppy framerates. 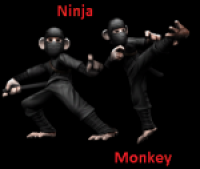 Ninja~Monkey hasn't added any games yet!